The original designer for the N64's GoldenEye 007 has bashed Activision's motivation for remaking the game. 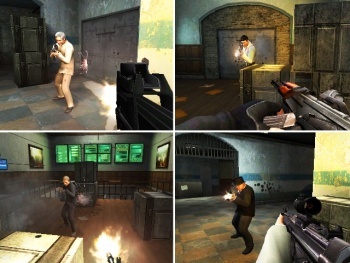 GoldenEye 007 was originally released for the N64 and is fondly remembered as both a great single-player and multiplayer game. Though it always seemed like a natural for re-release, it was only rumored until Activision's recent announcement of a remake for the Wii that replaces Pierce Brosnan with current Bond Daniel Craig. Martin Hollis, the designer for the original GoldenEye 007, seems a little salty about what he thinks is the motivation behind the remake. Speaking to Official Nintendo Magazine, Hollis alleged that Activision only wants to use the GoldenEye name to earn a buck. "I imagine it is a business decision isn't it," he said. "This name is valuable, let's use it." "I find it hard to picture Activision's top management being excited about the original and wanting to do it justice," Hollis continued. "In fact, I find it hard to imagine them being excited about any game. It's my perception that they are trying to be EA, only more so. I think they are doing a fine job at that." However, Hollis isn't mad at Eurocom, the developer working on the GoldenEye 007 remake for the Wii (a DS version is also under development by N-Space). "I know and like Eurocom," he said. "I think they are a good company. I'm confident they have done their very best." I don't know if Hollis has something against Activision management, or if these quotes are out of context, but if he doesn't think they get excited about anything it certainly seems like he has an axe to grind with them. I'm not the type to defend upper management, but the development of just about any game that isn't freeware, especially one coming out of a company like Activision, should be motivated by business at least partially. A game should be fun, but it has to sell enough to make money too. Maybe Hollis is upset that he didn't get a crack at putting together the remake?